The Department of Fiber and Material Studies at the School of the Art Institute of Chicago (SAIC) invites applications for a full-time, tenured or tenure-track faculty position, beginning August 2018. Rank and salary are competitive with peer institutions and are commensurate with quality of practice, scholarship, and current academic research, extent of teaching experience, and current professional standing. The Department of Fiber and Material Studies emphasizes the production of textiles and fiber arts within a contemporary art context and supported by current theoretical discourse. 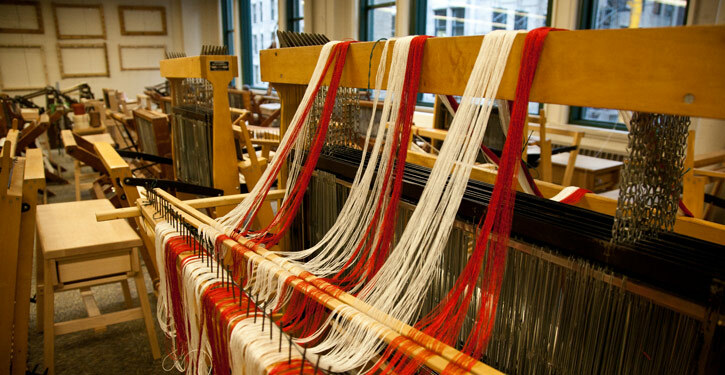 Students study a vast range of textile construction, surface techniques, and processes, including: weaving, print, dye, stitch, soft sculpture, felting, knitting, crochet, spinning, collage, and embellishment. Our studios feature analog and digital equipment, and students engage in thinking and working with hand processes while incorporating digital technologies and computer-assisted approaches to making. The department currently has 6 full-time and 16 part-time faculty. It has up to 20 dedicated MFA students, and over 750 undergraduate enrollments in 60 courses each academic year. Full-time faculty in Fiber and Material Studies teach and advise undergraduate and graduate students within the interdisciplinary art and design school environment of SAIC. Full-time faculty must maintain an active professional practice, provide vision and direction as the Department Chair on a rotating basis, and participate in the SAIC community through ongoing curricular development and departmental and school governance. An MFA or equivalent terminal degree is preferred. Candidates with a nationally/internationally recognized studio practice and strong exhibition record and/or accomplishments within their field of cultural production preferred. The candidate should be well versed in historical and critical dialog as related to the field of fiber and material studies within a broader contemporary art and cultural discourse. Knowledge of world textile history is highly desirable. The Fiber and Material Studies Department seeks candidates with a minimum of three years of teaching experience at the college level or its equivalent, and who can teach both analog and digital technologies within one or more of the following areas; print, textile construction, sculpture, and weaving. The ideal candidate will contribute to the diversity of the School by bringing a perspective, way of thinking, and/or a unique set of experiences that expand the intellectual conversations and practices in the field. On or before January 8, 2018 please submit application materials via http://SAICfaculty.slideroom.com. You will be asked to create an account after which time you may complete the application comprised of fill-in fields and uploaded documents. SAIC will underwrite the application fees; you will not be charged to apply for the position. You are encouraged to begin the application well before the deadline. No applications may be submitted beyond the deadline for any reason. cover letter stating your interests and qualifications; resume or curriculum vitae; artist statement; statement of teaching philosophy (please include your thoughts on teaching to a diverse student body and creating an inclusive learning environment); documentation of professional work; two examples of course syllabi taught. OPTIONAL: separate documentation of students’ work, if available. A leader in educating artists, designers, and scholars since 1866, the School of the Art Institute of Chicago (SAIC) offers undergraduate, graduate, and post-baccalaureate programs to students from across the globe. Located in the heart of Chicago, the School is one of the largest and oldest private schools of art and design in the country with programs reflecting current practices in art. SAIC’s educational philosophy is built upon a transdisciplinary approach to art and design that provides unparalleled opportunities for students to develop their creative and critical abilities with renowned faculty who are leading practitioners in their fields. SAIC’s resources include the Art Institute of Chicago and its Modern Wing, and numerous special collections and programming venues that provide students with exceptional exhibitions, screenings, lectures, and performances. The campus is located on Chicago’s magnificent lakefront amid the city’s cultural and architectural treasures. This entry was posted on Monday, September 18th, 2017 at 3:16 pm	and is filed under General, Jobs, Reseach. You can follow any comments to this entry through the RSS 2.0 feed. You can leave a comment, or trackback.